Bro. 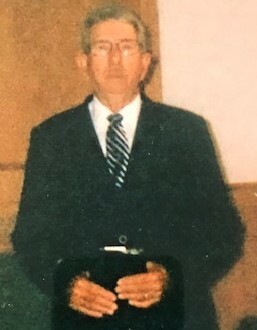 James Clinton Wright, age 81 passed away Sunday, October 7, 2018 at his home in Walling. Bro. James was born on November 23, 1936 in Warren County, Tennessee to Creed Wright and Alberta (Peach) Williamson Wright. Bro. James was a member of New Hope The Baptist Church. He Was Ordained to preach the Gospel April 1969, pastor New Hope Church for 33 years. Also pastor several other churches in our area. He also preached several Revivals all over Tennessee. He retired from Century Electric Company after 30 years of service. He is preceded in death by his parents; 3 sisters, Azzlena Markum, Emma Dell Boren, and Lois Hennessee. Bro. James is survived by his wife Juanita (Anita) Billings Wright; daughter, Kathy Wright; sister, Frances Martin; brothers, Robert Wright and Ernie Wright; honorary grandchild, Kayla Smith; and a host of nieces and nephews. Pallbearers, Rick Hennessee, Jeff Hennessee, Joe Don Wright, Michael Wright, Terry Osment, John Chenkus; Honorary Pallbearers, Fellow Ministers. Family will accept visitors on Tuesday, October 9, 2018 at Thurman Funeral Home at 3:00 P.M. till 8:00 P.M. Will be at the church, Wednesday, October 10, 2018 at Spring Hill The Baptist 11:00 A.M. till time of service at 3:00 P.M.
Service will begin at 3:00 P.M. Wednesday, October 10, 2018 at Spring Hill The Baptist Church. Internment at Spring Hill The Baptist Church Cemetery in Walling. Officiating will be Bro. Garry McBride, Bro. Alton Marcum, Bro. Richard Wood, Bro. Johnny Adcock.